ST.-QUENTIN-EN-YVELINES, France — The final question of the U.S. Team's post-loss press conference was directed at Jordan Spieth and Patrick Reed. Team Spieth/Reed had been a lethal combination in the last two Ryder Cups, going 5-1-2, but hadn't played together in the U.S. defeat in France. Were they surprised, a reporter asked, not to be paired together this year? The question hung in the air as Spieth and Reed made eye contact at each other from opposite ends of the long table. Reed broke into a wide grin and considered his microphone, something clearly on his mind, but Spieth ended up tackling the question. He wasn't surprised by the pairings, he said. "We were totally involved with every decision that was made." Spieth, Reed, Justin Thomas and Tiger Woods had played practice rounds together, but the teams that emerged from that foursome were Thomas/Spieth, who went 3-1 for the week, and Reed/Woods, who went 0-2. 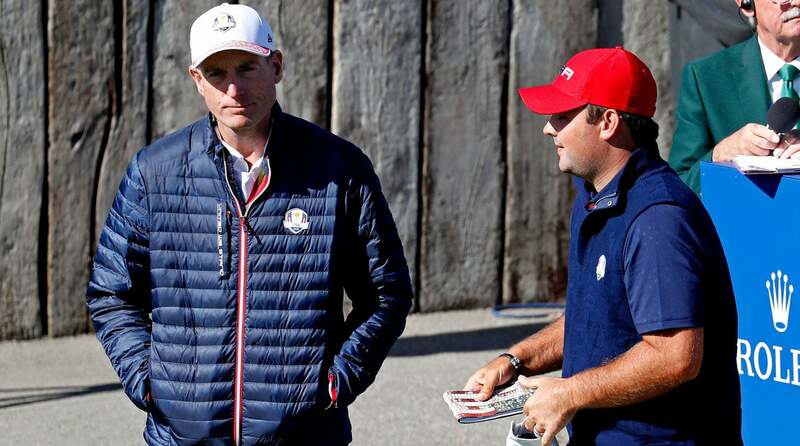 Patrick Reed talks with United States captain Jim Furyk on the first tee during the Sunday singles matches at Le Golf National. "Jim allowed it to be a player-friendly environment, and we were involved and we thought that the teams that came out of our, you know, four-man squad, what do we call it, 'Fire Team?' What is it, Tiger?" He looked down the table to a lethargic Woods, who murmured affirmation into his microphone. "Okay, good talk, Tiger," Spieth said, laughing. Bubba Watson jumped in, needling Woods. "He's tired. Seven out of 8 weeks or whatever," he said, referencing Woods's earlier comment on his packed playing schedule. Spieth continued. "We had two potentially fantastic teams, and we went out confidently and tried to play our best." Furyk jumped in, too, adding that the teams were "totally my decision and my call." Reed didn't end up saying anything. But he said plenty when a New York Times reporter reached him by phone less than an hour later. Reed told the Times that when Spieth fielded the press conference question, he was considering a more explosive answer. “I was looking at him like I was about to light the room up like Phil in ’14,” he said. Phil Mickelson went scorched-earth during the loser's press conference in 2014, criticizing captain Tom Watson after he was benched for Saturday's sessions. Reed, the U.S. team's top point-getter in the last two Ryder Cups, also critiqued the decision to bench him for each afternoon session. “For somebody as successful in the Ryder Cup as I am, I don’t think it’s smart to sit me twice,” Reed said to the Times. He added that, when it comes to checking egos, the European team does a far better job than the U.S. Justine Reed, Patrick's wife, had turned to Twitter over the weekend to complain about the pairings. "Maybe you should ask Jordan," she told one user in reference to the Spieth/Reed split. She also called coverage of her husband "unspeakably awful." As U.S. players filed out of the press conference Sunday evening, cheers from the European celebrations cascaded down from the hill above. One throng of fans chanted the names of Francesco Molinari and Tommy Fleetwood, who had gone undefeated as a team. The contrast was obvious as the American side climbed back onto their fleet of golf carts and headed for the team room.